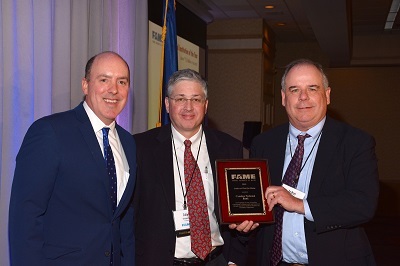 Camden, Maine, November 16, 2018 – The Finance Authority of Maine (FAME) presented Camden National Bank with the Lender at Work for Maine Award at last night’s annual Showcase Maine event in Portland. The award category was reserved for lenders with over $1.5 billion in assets. This is Camden National Bank’s ninth time as a FAME awardee, recognizing the Bank’s outstanding commitment to supporting Maine businesses and jobs. Over the past year, Camden National Bank partnered with FAME on 57 loans totaling over approximately $18 million. This, in turn, helped to create 79 Maine jobs and retain an additional 566 jobs. FAME is a quasi-independent state agency that provides financial solutions that help Maine people achieve their business and higher education goals. FAME, which is celebrating its 35th Anniversary, helps create a stronger Maine workforce by focusing on the nexus of economic and educational development. Camden National Corporation (NASDAQ:CAC), headquartered in Camden, Maine, is the largest publicly traded bank holding company in Northern New England with $4.2 billion in assets and nearly 650 employees. Camden National Bank, its subsidiary, is a full-service community bank founded in 1875 that offers an array of consumer and business financial products and services, accompanied by the latest in digital banking technology to empower customers to bank the way they want. The Bank provides personalized service through a network of 60 banking centers, 71 ATMs, and lending offices in New Hampshire and Massachusetts, all complemented by 24/7 live phone support. Greenwich Associates named Camden National Bank a 2018 Greenwich CX Leader in U.S. Retail Banking, a designation that recognizes top U.S. banks in customer experience. In 2018, Camden National Bank received the “Lender at Work for Maine” Award from the Finance Authority of Maine. Comprehensive wealth management, investment and financial planning services are delivered by Camden National Wealth Management. To learn more, visit CamdenNational.com. Member FDIC.